Photos by Ben Gray unless otherwise noted. 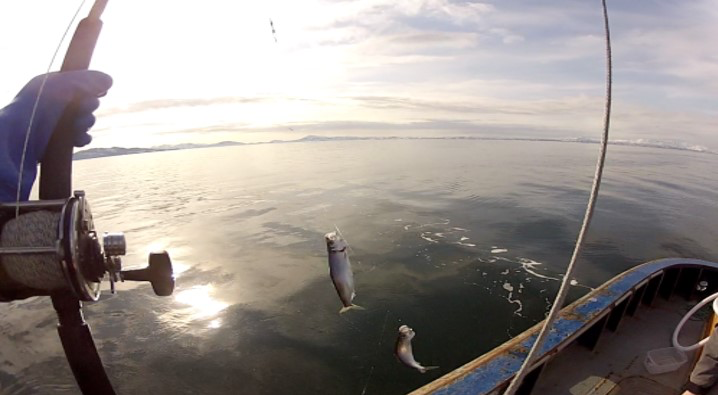 Pacific herring, a small forage fish, has long been considered sensitive to handling. 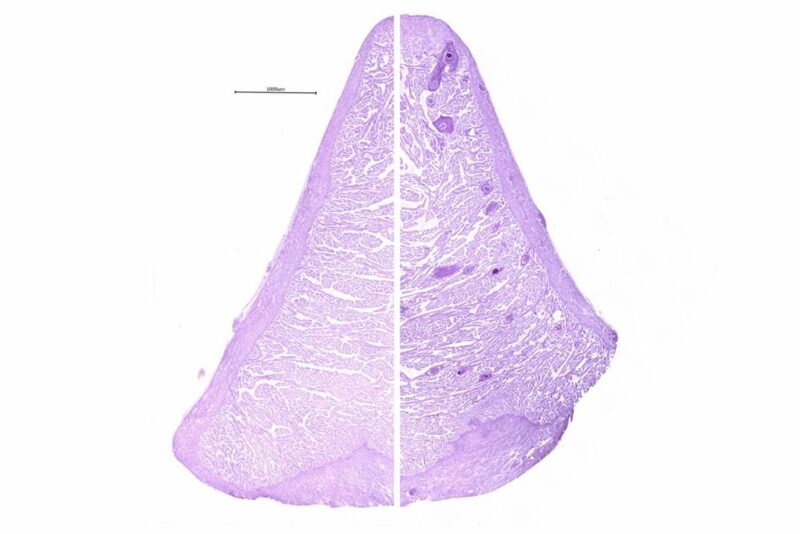 As a result, there are few herring tagging studies. 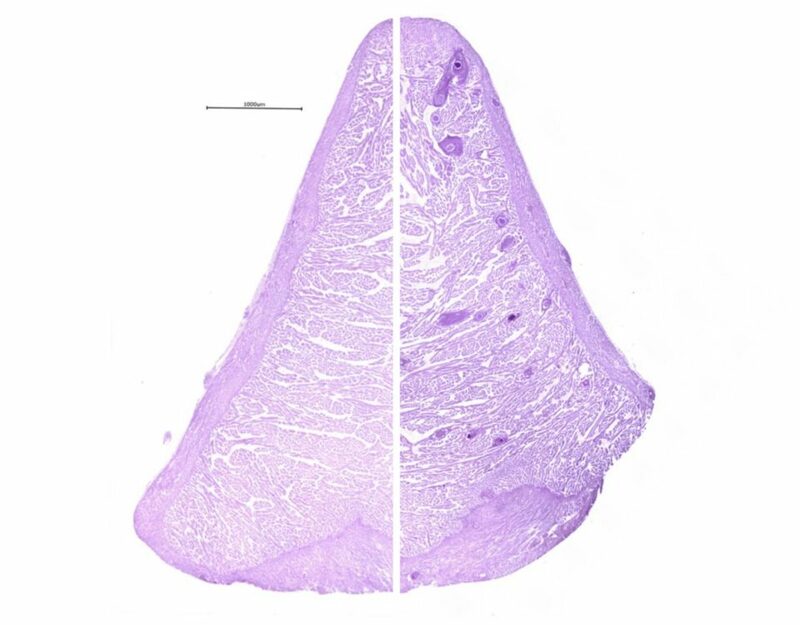 In the past 10 years, lab experiments showed tags could be successfully implanted in herring. Building on these results, scientists from Prince William Sound Science Center and NOAA implanted tags in wild-caught Pacific herring during spring 2013 while they were on their spawning grounds. After their release, we were able to detect them for up to nine months (when transmitter batteries died) at the Ocean Tracking Network arrays, a series of underwater receivers placed in strategic locations within the Sound. Based on that success, in April 2017 we tagged 124 herring at Port Gravina. In April 2018 we tagged 202 herring, this time at Port Gravina and Hawkins Island, near Cedar Bay. Map of herring capture/release locations. 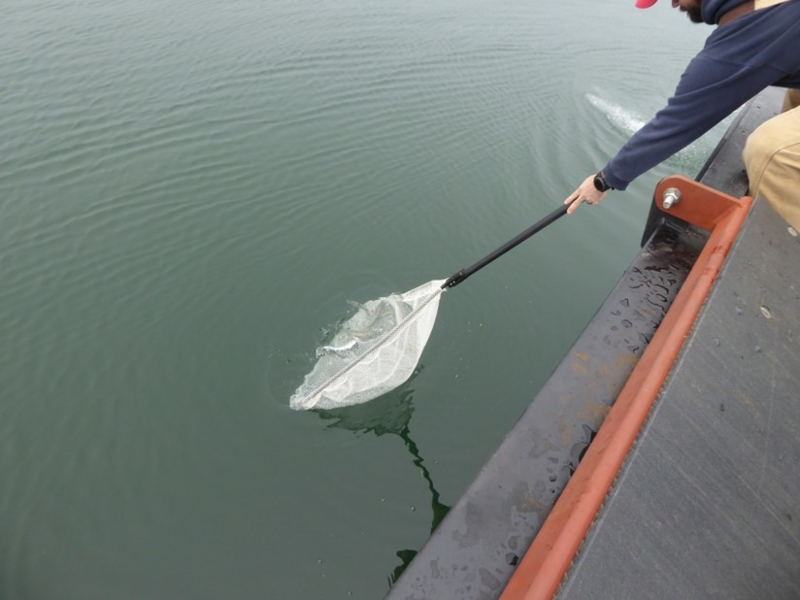 Efforts were focused at 2018 spawning locations near Port Gravina and Cedar Bay/Canoe Passage along Hawkins Island. So how is a herring successfully tagged? First, we jig them up. Herring are captured using jigs to decrease stress and descaling. Once caught, they are put in a holding tank. Herring typically school and during their brief time in captivity, we keep all herring in small schools that included herring “buddies” not implanted with tags. Jig-caught herring being held in a tank. A pump continuously brings in fresh seawater. Herring are kept in this tank until surgery, then placed in a recovery tank afterwards. Next, each herring selected for tagging is put in a small tub with a sedative. Within two minutes they can be easily tagged (in other words they do not squirm!). After removing them from the sedative, we quickly measure and weigh each fish. Then they are put in a tagging “cradle” where sea water is pumped over their gills. A small incision is made, and the tag is inserted, followed by two sutures to close the incision. Voila! The herring is ready to go in the recovery tank. A herring being prepped for surgery. This herring has been sedated and placed in a tagging cradle. The cradle is fit with an aquarium pump which keeps the herring breathing by forcing water into its gills. The tags are inserted into the body cavity through a small incision made along its belly. 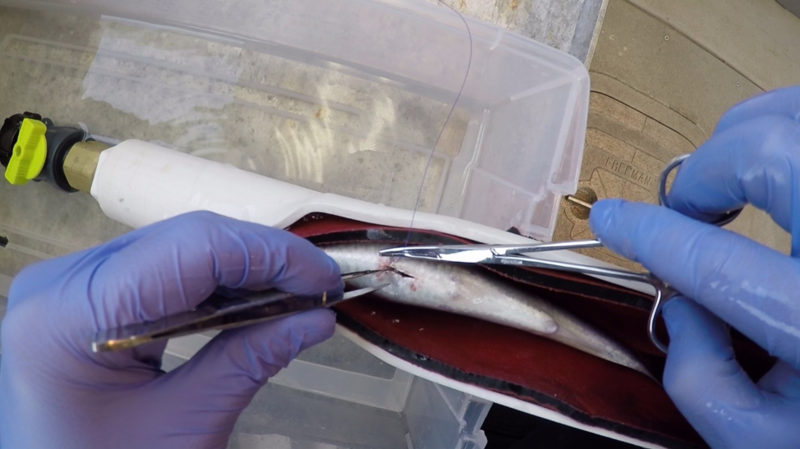 Once the tag is in place, the incision is sutured shut and the herring will be placed into the recovery tank. Typically, within a few minutes, the herring has recovered and is swimming with his school in the tank. Once that group of herring is tagged, we release the tagged herring and their “buddies” together, reducing the susceptibility of the tagged fish to predation upon release. After all herring have successfully recovered, they are released. Herring are always released near a school to increase their chance of survival. 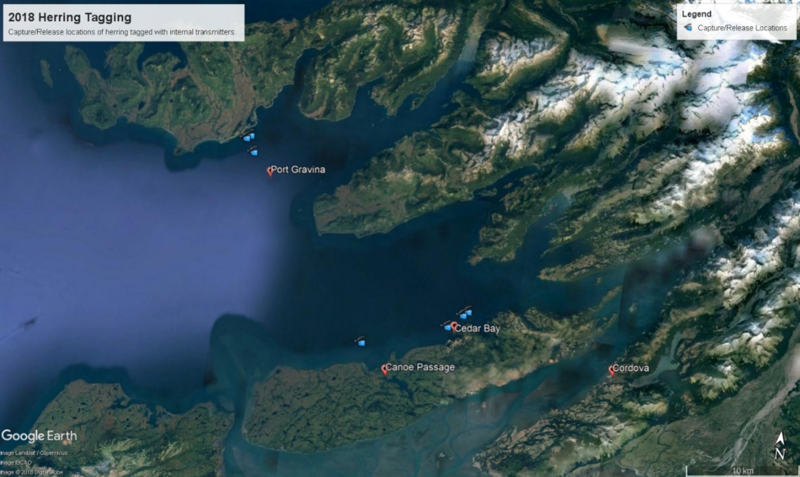 Receivers near Port Gravina and Canoe Passage/Cedar Bay were deployed where herring were tagged in 2017 and 2018. 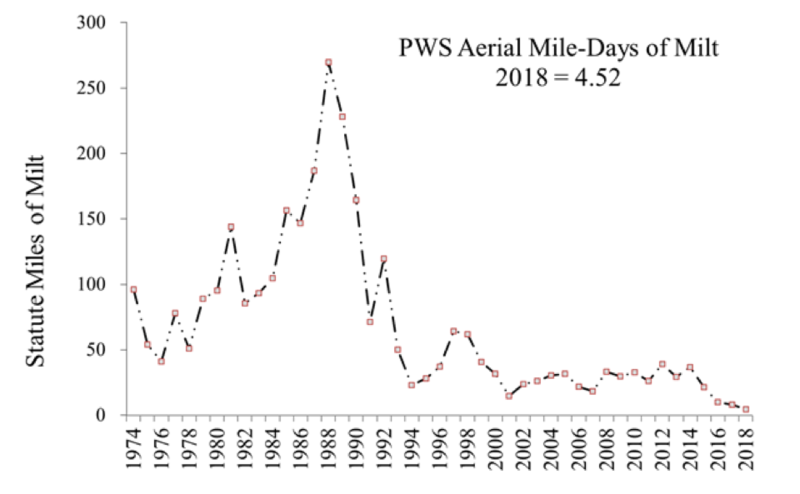 This will help us examine how long they stay in the region after the major spawning event, and to see if the herring return to the same location the following year to spawn. These receivers are owned and maintained by PWSSC. The arrays located at Hinchinbrook Entrance, Montague Straight, and the southwest passages form a line across the major entrances. 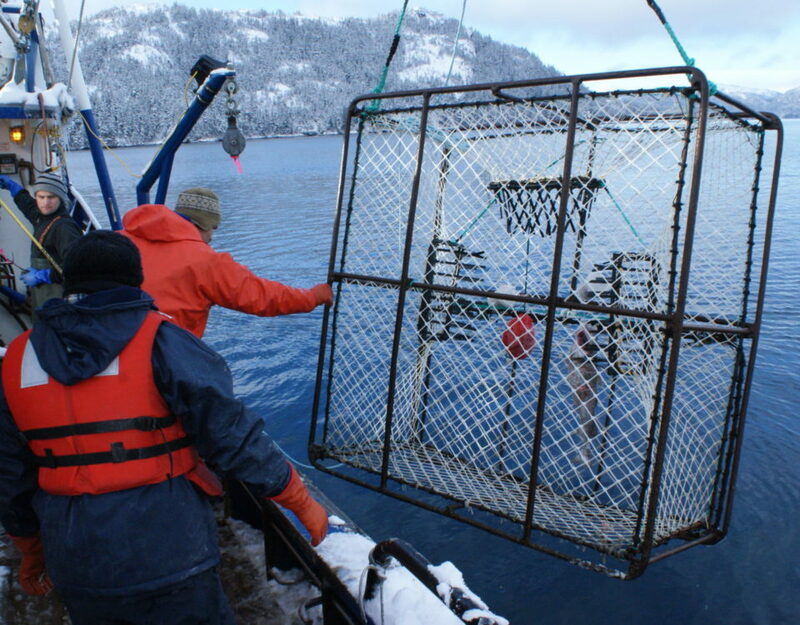 In areas along those lines, known to be heavily trafficked by herring, a second line of receivers was placed (thereby forming a gate) to determine entrance and exit timing between Prince William Sound and the Gulf of Alaska. These receivers were installed with funding from the Ocean Tracking Network and are maintained by PWSSC. 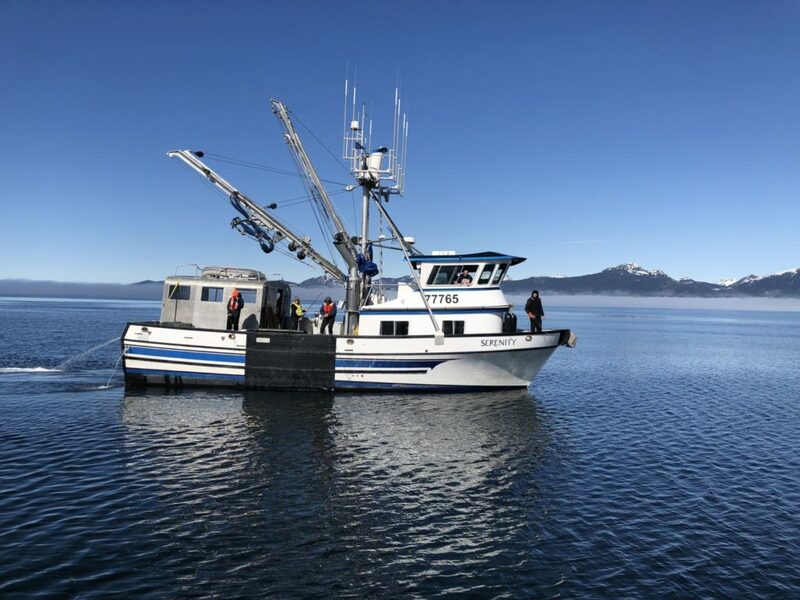 Using all the receivers, and with a two-year tag battery life, researchers can now start piecing together herring movements throughout the year. 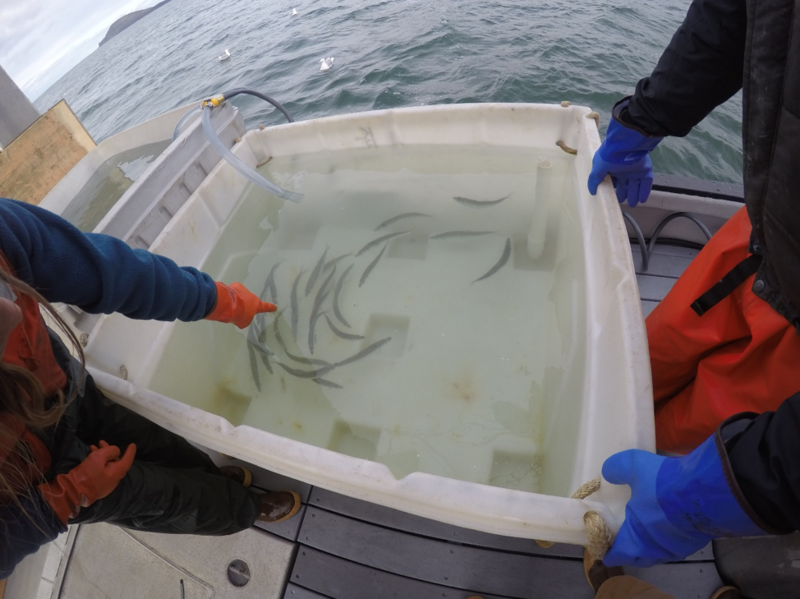 Knowing where the fish are, researchers can improve the design of studies that examine factors such as predation, food availability, and stock genetics that affect herring populations. 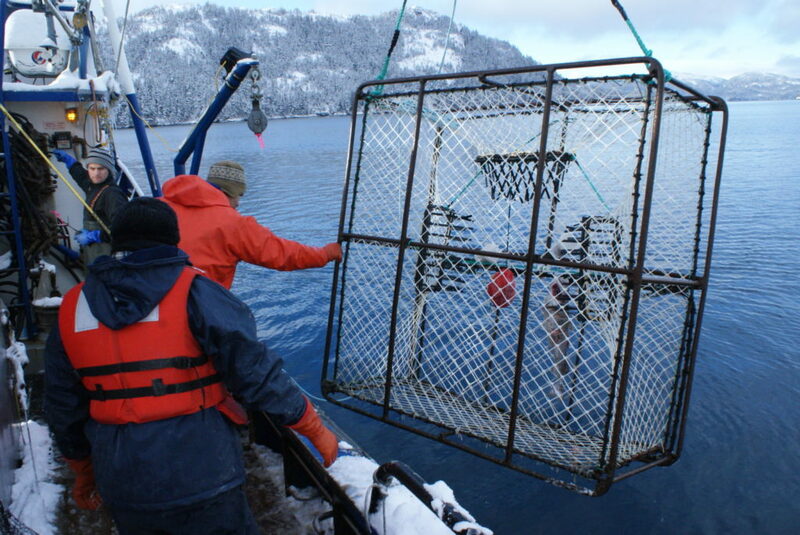 Our tagging methods were developed with funding from the Exxon Valdez Oil Spill Trustee Council. 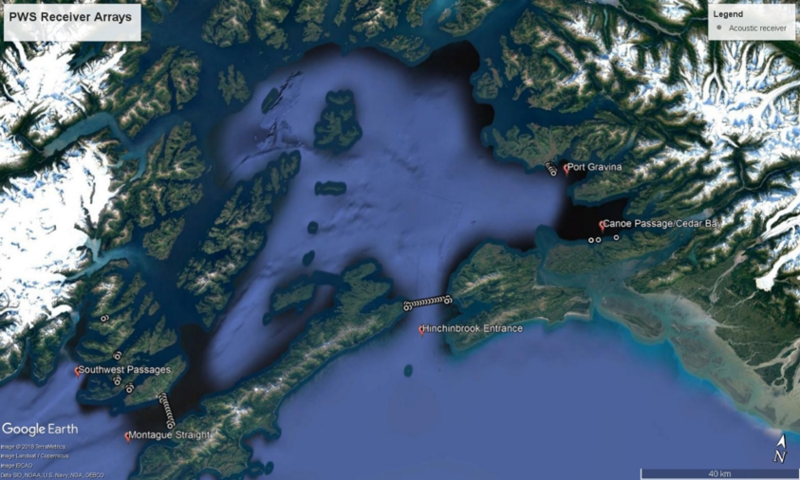 Locations of acoustic receivers within Prince William Sound. The receivers detect and store information from each tagged herring that swims within its detection area (i.e., 500+ meters, depending on ocean conditions).